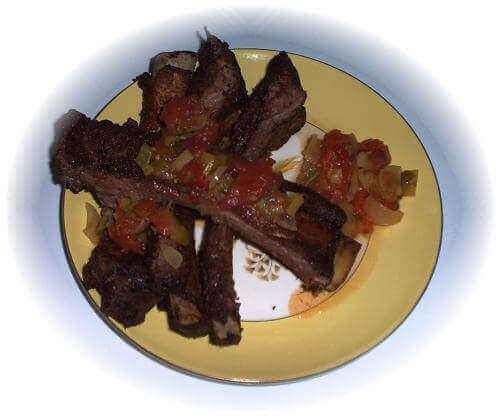 This spicy beef rib recipe is an easy one to put together. The seasoning is simply pre-packaged taco spice blended with a few additional ingredients. If you like tacos, then you'll love these ribs. The first time I made this recipe, the flavor was too intense. I used packaged taco spice straight from the bag to season the ribs. Good idea, but it needed some work. After a few tries, I found the combination of spices that mellowed the taco flavor and reduced the saltiness. Mix together all of the spices. Reserve one tablespoon of the rub mixture to use in the basting sauce. Coat the slab of beef ribs with the mixture, and wrap them it in plastic wrap. Let it rest overnight in the fridge. I have smoked this beef rib recipe with mesquite and the flavor was great. Oak would be a good choice of smoking wood, too. The ribs will need six to eight hours in a 225˚F smoker. Baste the ribs once an hour, using a mixture of one cup water (or beer), two tablespoons vegetable oil, one tablespoon of vinegar, and one tablespoon of the rib rub seasoning. You can use the foil-cheat method to shorten the cooking time. After three to four hours of smoking, wrap the ribs tightly in a double layer of aluminum foil and return to the smoker. No need to use any more smoker wood chips after wrapping the beef ribs. Continue cooking the ribs for another 2 to 3 hours, or until the meat pull away from the bone easily. When done, let them rest, still wrapped up with their juices, for 30 minutes. Doing this will help them become more tender and juicy. When it's time to serve 'em up, skip the barbecue sauce and serve these ribs with a good salsa and cold cerveza! My preferred brand of salsa is Senor Stan's, which has an excellent flavor.